As I always say iPhone 6S is still a better option to look for, even after iPhone 7 has been launched. 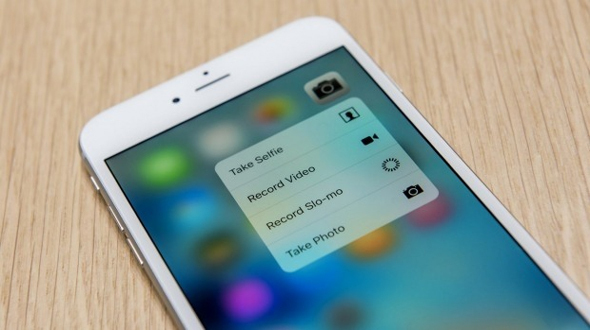 iPhone 6S comes equipped with features like 3D Touch and Live Photos, which have earned much fanfare from the press. Today in this article we are going to talk about the 7 tips and hacks for iPhone 6S, which will help you make your experience better with your device. Adjust the strength of your "hard-press"
The key to using the 3D touch feature of the latest iPhone is all in mastering the "hard-press." The trick is to press the app harder than you normally would, but not long enough to drag or delete it. If you treat your iPhone with the tenderness of a new-born infant or manhandle it like it's a piece of Play-Doh, this could present a problem. Luckily, you can adjust your iPhone's sensitivity to 3D touch by going to Settings > General > Accessibility > 3D Touch. Because of 3D touch, pressing really hard (also known as "hard-pressing") on an app or a link will prompt a new window of Quick Action shortcuts and other features on your favorite apps. The usefulness of this feature can vary depending on each user's individual preferences. If you tweet more than you lurk on Twitter, you'll no doubt be grateful for the Quick Action shortcut that lets you go straight to composing a new tweet. Does a friend text you for directions while you're the middle of creating a new playlist on Spotify? Simply "swipe down" on the message banner to reply without leaving the app in which you're currently working. If you're using 3D touch to "peek" at emails through the Mail app (simply hard-press an email to see a preview), you can "swipe up" too quickly reply to, forward, or move the email. Say you and a friend with whom you are brainstorming ideas with for a vacation to Greece messages you a new horde of links every hour or so. Thanks to 3D touch, gone are the days of having to press each link and waiting for a new Safari window opens up and loads in order to figure out its contents. Simply firm-press on a link and that will bring up a card preview of the page. You then have the option to open, copy, or add the link to your iPhone's reading list. Think you'd be more likely to use Siri if it spoke to an Australian male or British female? You can now switch up Siri's typical American female accent to something more exotic. Simply go to Settings > General > Siri > Siri Voice. Never feel self-conscious about handing over your phone to a friend again. A godsend of iOS 9 is the ability to yank every single one of your selfies or other incriminating photos from your phone's camera roll into a special "hidden" folder. Simply go to your camera roll, tap Select, pick all the damning images, tap the Share button, and select Hide. Your photos will then be stored in a Hidden folder, which you view under Albums. You may find that 16 GB of storage spreads a little thin in the iPhone 6s. The likely culprit is your camera. A perk of the latest iPhone's Live Photos feature is that it saves 1.5 seconds of video prior to each photo you snap. While this quirky new feature can result in some captivating visuals, it's a quick way to eat up your storage. Each Live Photo takes up the space of two still photos. Since Live Photos is the default option, you'll want to make sure you turn it off for most photos (i.e. still shots of the Grand Canyon, your parking space). Simply tap on the Live Photo icon on the top of your camera's viewfinder.